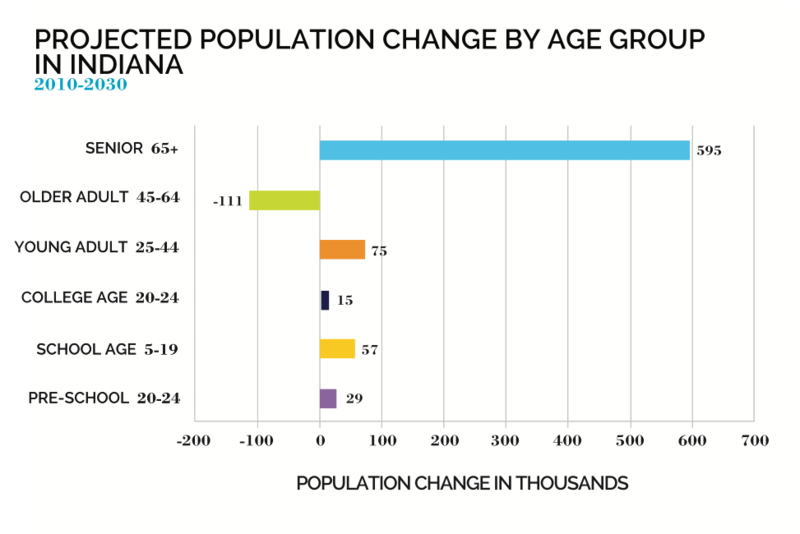 As Indiana’s population ages, specifically the baby boomer generation, it is projected that there will be a dramatic shift in the demographic of the state. The first boomers hit age 65 in 2011 and the entire cohort will be of traditional retirement age by 2030. The percentage of Hoosier seniors is projected to jump from 13% in 2010 to 20% in 2030, dramatically increasing the amount of senior services required by the aging population. Access to nutritious food, transportation services, emergency services and shelter, case management, elder violence reduction, and local guardianship programs. Health education; intervention services for older adults, in-home health care, prevention and screening; and outcome-based neighborhood community wellness and fitness programs. Establishing and maintaining affordable and supportive housing for older adults, providing home care and maintenance services that enable older adults to safely remain in their homes, projects that increase neighborhood safety, and support to strengthen and enhance quality residential care programs for low-income older adults. Opportunities for older adults to utilize their talents and resources to improve their overall quality of life. Opportunities such as increased access to cultural and education opportunities, work training and job placement, life-long learning, civic engagement, and social and recreation activities that increase social interaction.